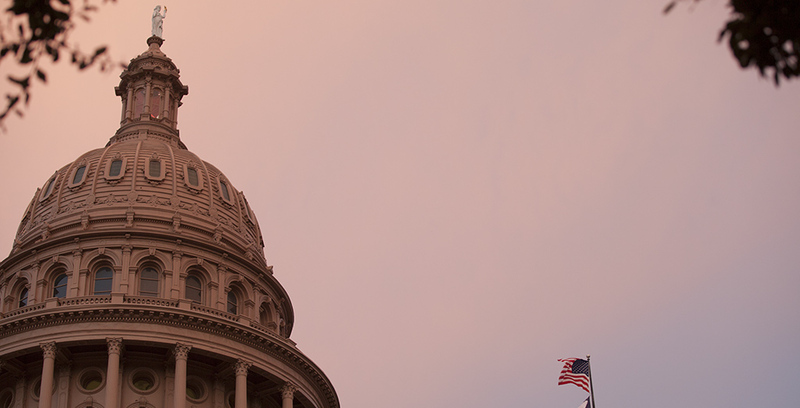 The 2016 election cycle features five highly competitive Republican primaries involving legislators who currently serve or recently have served in the Texas House of Representatives. This enables an assessment of the candidates’ voting records on the same scale, thereby allowing for an evaluation of their comparative location along the liberal-conservative dimension that drives legislative politics in Austin. Roll call vote data from the 2011, 2013 and 2015 regular and special legislative sessions were pooled together, providing a total of 3,151 non-lopsided roll call votes. Using a Bayesian ideal point methodology, these votes were utilized to calculate the mean ideal point (Liberal-Conservative Score) for each legislator for the 2011-15 timeframe, as well as to determine the 95 percent credible interval surrounding this point estimate. The results for these five races are displayed in the figure, with the legislators grouped by legislative district and their Lib-Con Scores (Mean Ideal Points) arrayed from left (least conservative) to right (most conservative). The five races vary considerably in regard to the ideological differences between the principal/sole candidates. The GOP primary in House District 55 between Rep. Molly White (R-Belton) and former Rep. Hugh Shine (R-Temple) is not included in this analysis due to Shine’s tenure being in the relatively distant past (1986-91). 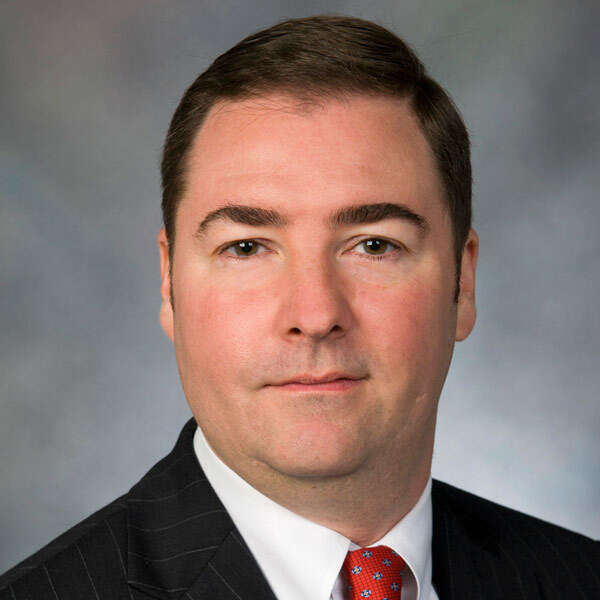 In Senate District 1, which spreads across 16 counties in the northeast corner of Texas, Rep. Bryan Hughes (R-Mineola) is going head-to-head against Rep. David Simpson (R-Longview) for the senate seat being vacated by retiring Sen. Kevin Eltife (R-Tyler). Also competing are Maj. Gen. James “Red” Brown of Tyler and Mike Lee of Queen City. While Simpson’s Lib-Con Score is significantly to the right of Hughes’, both are located well to the conservative side of the Republican Party House median, effectively representing only slightly different flavors of “very conservative.” Of the 154 Republican representatives who served during the 2011-15 period other than Speaker Joe Straus (R-San Antonio), who by custom rarely casts roll call votes, Simpson was the ninth-most conservative while Hughes was 41st. In a rubber match in House District 115, Rep. Matt Rinaldi (R-Irving) faces a challenge from former Rep. Bennett Ratliff (R-Coppell). In 2012, Ratliff edged Rinaldi out of a spot in a runoff in which Ratliff was victorious. In 2014, Rinaldi unseated the freshman Ratliff, and in 2016, Ratliff is seeking to return the favor by denying Rinaldi a sophomore term in Austin. While Rinaldi ranked as the most conservative of these 154 Republican representatives, Ratliff ranked as the 126th most conservative. The vast ideological gap separating these candidates provides GOP primary voters in northwest Dallas County with two very disparate ideological options on March 1. Among the three other primary face-offs, the least ideological distance between the candidates is found in the House District 1 and 4 races in northeast Texas, where Representatives Gary VanDeaver (R-New Boston) and Stuart Spitzer (R-Kaufman) face challenges by former representatives they defeated in 2014: George Lavender, (R-Texarkana) and Lance Gooden (R-Terrell), who are somewhat to their opponents' right and left, respectively. In the third match, Lubbock residents are presented with two slightly more distinct ideological options in the House District 84 battle between Rep. John Frullo (R-Lubbock) and former Rep. Jim Landtroop (R-Lubbock). Among these 154 Republican representatives, Landtroop had the 11th-most conservative voting record and Frullo the 79th. 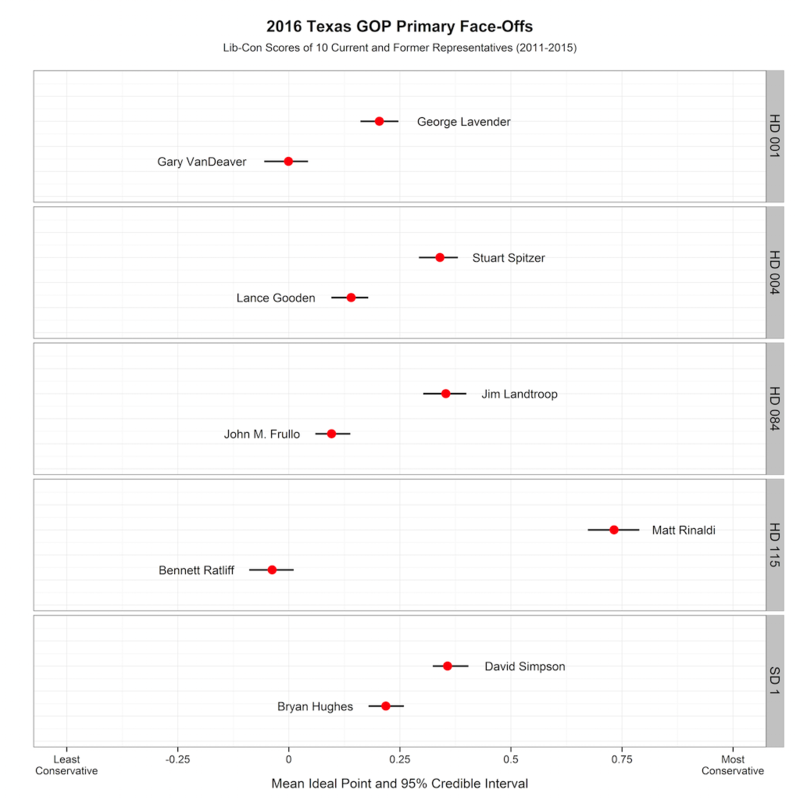 That is, while Landtroop’s Lib-Con Score locates him at the rightward edge of House Republicans, Frullo’s places him squarely in the middle of the Texas House GOP: more conservative than about one half and less conservative than the other. In most Texas House and Senate races, voters face a steep informational hurdle in attempting to predict how two competing candidates’ campaign proposals and rhetoric will translate into actual behavior in Austin. In these five legislative districts, however, Republican primary voters have the luxury of being able to compare the competing candidates using the same metric: their roll-call vote behavior during their recent tenure in the Texas House. In addition to hearing what both candidates have to say on the campaign trail, voters in these districts can take advantage of the candidates’ past floor behavior in the Capitol’s west wing to decide for themselves which candidate most closely aligns with their own ideological and policy preferences.